← Felix Makes the Picture Better! Pam’s Pictorama Photo Post: As you can see it isn’t like the Brits and the Aussie’s had this Felix thing all sewn up! Here are two photos of Felix parade floats in the US. One is a photo postcard (Oregon Laundry) and the other is a tiny snapshot. On top, the Rose Festival in Portland, OR,’29 – man, they could do my laundry any day! My hat’s off to the fine people of Portland, OR which seems, oddly, to be a hotbed of Felix photo activity. Go Portland! 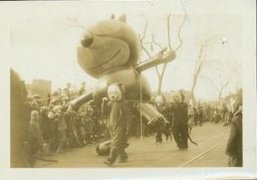 The snapshot, identified as the Bamberger’s Parade, Thanksgiving, ’31. Presumably this is Newark, NJ – a fine little home movie color film snippet, Bamberger’s Thanksgiving Parade circa 1933, is absolutely worth the four and a half minutes on NJ.com and suffering through the commercial at the beginning. Felix doesn’t show up, but Mickey puts in a very brief appearance. An indication that perhaps by ’33 or so Felix’s star was starting to fade a bit in the USA, and Mickey was the big kid on the block now. Mickey parade photos to follow in the future! Great photos! Thanks so much for sharing these. Thank you for liking! Much more coming – have barely touched the photos!